Discussion in 'Other Sport' started by Raoul, Dec 31, 2017. So that’s Nadal, Wawrinka, Djokovic and Murray with no tournaments leading up. I can see two not even playing. Nadal probably is the most likely to play. Aussie open went from one of my most looked forward grand slam to a downer. Shame so many of the top players are so consistently crocked recently. It was the same at the ATP Finals, much less of an event without them. It does however leave the door ajar for players such as Dimitrov and Sock to try and break in to the top 4 and stay there because we are entering a new era where the 4 players mentioned by Bojan11 above will not be around. Murray's Instagram post makes it sound like surgery might be the only option. Could be the end of him as a top player, the likes of Hewitt and Nalbandian never really recovered from theirs. Different sport. Keane had one too but was never the same after that. Hope Murray retires from playing. Time to think about his long term health and it's unlikely he will get back anywhere close to his top previous standard. A 50% Murray got to the 5th set of Wimby's quarter. The field is so weak atm that once he gets back to any reasonable semblance of form he's in with a chance so I don't see him retiring, yet. Pulled out of Aussie open too, really bad injury to have, could be finished as a top level player which is a shame. Watching Federer vs USA! Didn't get to watch him last year. Felt bad for Sock lol. The cheers for Federer were so much louder. Doesn’t sound too good for Murray. Only caught the very last game of the Federer - Zverev match. Federer looked like he activated some cheat codes. Ominous form. Djokovic and Nadal are in a exhibition tournament this week. The Aussie open organisers must be praying they get through that. It went from one of the most anticipated Aussie open to now looking like another boring slam if Nadal and Djokovic pull out. The AO last year was a brilliant tournament and Djoker/Murray barely factored in it. It's up to the young 'uns to pose a challenge and make it exciting, and the likes of Stan, Nishikori, Cilic etc.. as well. Dimitrov-Nadal semi was a roller coaster of a match for example. 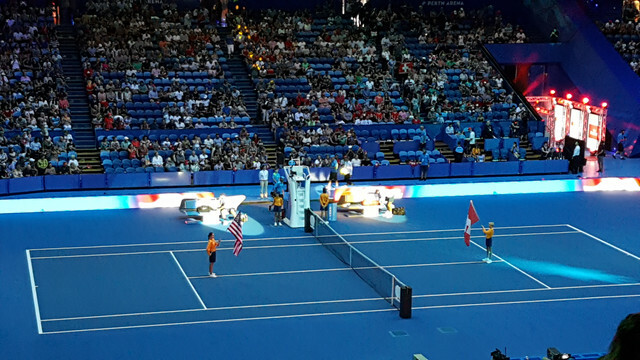 Caught the highlights of Federer at the Hopman Cup - he looked imperious. When he plays like that, it's easy to see why he has such a cultish following - just beautiful tennis. Are those two definitely playing? I was speaking generally, not confirmed yet but Nishikori likely out. Stan I think will make it and the event director seems confident Novak and Nadal will be there. To be brutally honest, I wouldnt mind a walkover of a tournament for Fed after the way Nadal breezed through USO but he didnt exactly look convincing in Perth, scraping through against Sock and lost the tie break first set against Sascha. So if he's not likely to win I dearly hope that one or some of the younger guys can make an impression this year. Nishikori is officially out while Wawrinka and Dkokovic still seem very doubtful, Nadal seems guaranteed to play unless he has another issue although how sharp he will be is questionable. Generally I don't care who wins the grand slams but the last two of last year on the men's side were so underwhelming, the women's events were good, due to the injuries and lack of high quality opposition for the eventual winners (the French was slightly different because although it was a procession at least Nadal had to beat some very good players). I really hope if Federer does win it then he is at least properly tested by some of the younger players stepping up, it's time for the likes of Dimitrov, Zverev and maybe even Kyrgios to get to a slam final this year. I was slow on Nishikori, last I checked was couple of weeks ago for all male players. He's out. Dimitrov generally plays well here so I will definitely root for him if Fed is out. Kyrgios as well but despite looking sharp and winning a title he's just a bad game away from imploding. Sascha looks good so hopefully he'll make the quarter at the very least this time round. He had that at Wimbledon.. It'll probably be several decades before we see a worse slam than last year's USO... As long as RLA plays like it did last year it should be a fun tournament again this year, even with all the injury worries. That was due to Fed and Nadal coming back to a level that nobody expected them to ever again. Feds looked a bit shakey since Wimbledon. He was fantastic in Shanghai but other tournaments not so much. Nadal injured his knee towards the end of last season and we not sure if he is even 100%. There was more intrigue to this one because of how Djokovic/Murray would react after their long lay offs. Murray isn’t going to be back until Wimbledon now. His doctors have said 12 weeks. But it would be foolish for him to play on clay as that’s the surface where you have to do the most moving around and it wouldn’t be wise to return on that. Nishikori withdrew last week. Stan is in a similar situation to Djokovic. But let’s face it the back end of the French, Wimbledon or US open were terrible. The semi finals and finals were not really great to watch. If Djokovic can reach near his best then he would have made those tournaments a lot more exciting. It wouldn’t have been straightforward for Nadal or Federer. His Wimbledon was comparable to Nadal's French. Dominant but still had to beat good players. At the USO Nadal played PCB in semi and Kevin Anderson in final ffs, you couldn't draw a more walkover-y route than that. No he didn’t. He played Del Potro in the semi and that wasn’t really a walk over considering he just beat Federer. Del Potro played well in the first set too. PCB played Anderson. Nadal played Delpo in the semis. PCB - Anderson was the other semi. I proably wouldn't actually put that Wimbledon on par with Nadal at the French due to the semi and final opponents. Mea culpa. For some reason I remember it as Dolgopolov, PCB and Anderson. Still, the larger point stands. Delpo was carrying an injury as well throughout the 1/16- quarter-semi. None of that is Nadal's fault, you play the opponent you get, but overall the stars aligned to give him probably the easiest Slam of his career, including all the clays. Fwiw, based on form, even if Fed had beaten Delpo it wouldn't have changed anything. You ain't beating Nadal when you dropped 2 sets to Tiafoe and Youzhny in the same tourney. Thiem-Stan and Berdych-Cilic is about even if you look at their form leading to and in the tournament. Stronger semi opponent for Nadal, just, given Thiem won a clay Masters. Stan had never lost a grand slam final whilst Cilic wasn’t even fully fit. So strong final opponent too. Thiem didn't win a Masters, he lost in the Madrid final to Nadal and got humiliated by an out-of-sorts Djokovic in the semis in Rome. Even with his rabbit in the headlights act in the FO semi he was probably still tougher than Berdych to be fair. Also worth remembering Fed had to go past Dimitrov in R4 and Raonic in the quarters while Rafa had RBA and a walkover against PCB. Both of them made those two slams look straightforward but Wimbledon was the tougher path. Draw now out for the Aus Open. Nadal and Federer should be fairly pleased. Tricky draws for A. Zverev (Federer's half) and Kyrgios (Nadal's half). Zverev projected to play his brother in R3 and then Djokovic in R4. Will have to try and find the other players projected draws. Slightly trickier draw for Fed, meeting a servebot since Round4 is not ideal with the surface playing fast this year again, and DelPo is always a big threat. Nadal should coast through until the semi, by which point we'll see if Dimitrov or Kyrgios can do anything. The layout of the website on the AO site is awful, but it seems Djokovic might meet Stan early on, and the Zverevs. And you forgot to add Wawrinka to this lot!! It is slightly trickier than Nadal but it is not that bad. He can face only one of Zverev/Thiem/Wawrinka/Djokovic. It is not that he is facing them all. Plus Wawrinka and Djokovic coming from long absence are not going to be as tougher challenge for Federer in current form, if at all one of those two makes it to semi. I copied and pasted it from twitter. I don't think Stan will go far at all given his fitness concerns. I'd also be shocked if Thiem made the semi final. Not showed much promise on anything except clay. Nasty draw for Federer. Del Potro is my dark horse, he can beat anybody on a fast hard court. Nobody's talking about him, but he's been the 3rd or 4th best player in the world since the US Open. Nadal, if fit, should coast. Another easy quarter for him. No real threats until Cilic, who's had his own injury problems. Djokovic won't complain, either. Monfils looks daunting on paper, but he's the kind of player Djokovic eats for breakfast (H2H 14:0). Wawrinka is the great unknown and Thiem is useless on fast hard courts. It's not that bad for Federer, admittedly you want to meet Delpo as late as possible given how he runs out of gas by the semis but he's playing Auckland for some reason so maybe he'll tire out quicker. Raonic is a potential nightmare in R4 but then there's a good chance he doesn't even get that far. Rafa will obviously be the most pleased, even if he's half fit he'll cruise to the semis. Injury permitting I think it'll be him vs Djokovic in the final. Glad Djokovic has a decent chance to make the semi. That’s not strictly true. I rather play Del Potro early on in the tournament when he’s not in full flow. When he’s in full flow he is hard to stop. His stamina will have improved after the US open. This guy is capable of playing marathon matches like he has against Djokovic and Murray. He sometimes looks tired but then comes out with a brilliant forehand. You also have to remember he was suffering with a illness vs Thiem and yet still came back after two sets down. Thiem did choke it, but Del Potro still had to put pressure on him. 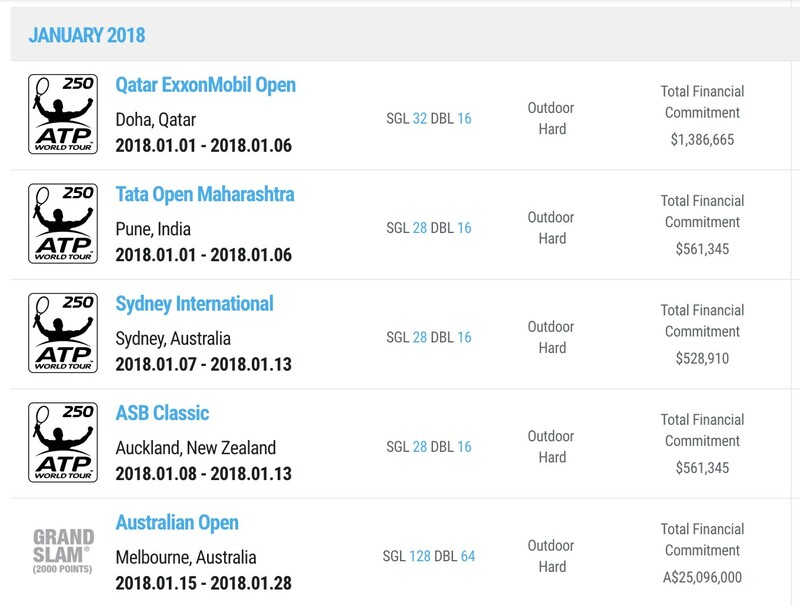 Also Auckland is his first tourney since Paris last year. He’s in the semi finals and should beat Ferrer. It should give him a confidence booster. It also means he is back in the top 10 for the first time since 2014 which is a morale booster too. He is starting to look 100% and hopefully at 29 he realises he doesn’t need to play every tournament.